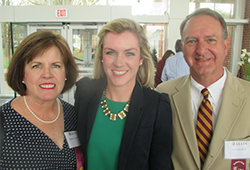 Jay and Patricia Caler P'15 of Denver, North Carolina, want to help provide the same transformative experience their daughter, Katie '15, enjoyed as an Elon student. The $100,000 estate gift to endow the Caler Family Global Engagement Scholarship will help students with financial need participate in one of the university's study abroad or Study USA programs, which are among Elon's high-impact learning opportunities. Preference for the scholarship will be given to students studying in the School of Communications, where Katie Caler '15 earned her degree. "We've always lived by the maxim, 'to whom much is given, much is expected,'" Jay Caler said. "The more we see of Elon, the more impressed we are with it, and we think that sort of excellence should be supported." In addition to their estate gift, the Calers have made a $25,000 commitment to enable scholarship funds to be awarded immediately and allow the couple to see the impact of their gift now. "We're grateful and excited to be in a position to make this gift," Jay Caler said. "This was a family decision and something our daughter Katie supported as well." Making global study more accessible to students was a natural choice for the Calers. Katie studied abroad three times, which gave her confidence to tackle challenges on her own, including navigating a foreign country and managing finances. The Calers understand firsthand the importance of encountering different cultures. They traveled to close to 40 countries during their respective 20-year careers in the Navy. Both retired as commanders, with Jay working in communications operations and policy, and antisubmarine warfare and Pat serving in recruiting and intelligence roles. "Study abroad is important for every generation to experience, and we want other students to be able to have the opportunities that our daughter had," Pat Caler said. "Many Americans don't have the experience of dealing with other cultures or an appreciation for how lucky they are to live in the United States." "It's one thing to read about a place or to take a virtual tour of it," Jay said. "It's quite another to go to a place and soak up the culture and to navigate for yourself. That's invaluable because the world is getting smaller, and the more people we have who have experienced the world, the better off we are going to be as a nation." "We are grateful to the Calers for their generous support of Elon," said Carolyn DeFrancesco, the university's director of planned giving. "When donors make a planned gift, they help ensure the future of Elon and create a lasting legacy for our students." The Calers have been impressed by Elon's leadership in global study and with all the Elon Experiences programs, which include internships, service learning, leadership development and undergraduate research. "There is an expectation at Elon that these programs are things that all students are expected to do to round out their education, and study abroad is a big part of that. That really stuck with us and impressed us," Jay said. "We hope that this scholarship benefits an Elon student who may be the first person in their family to attend college or who has never been outside the country and that it allows them to broaden their horizons, eliminate preconceived notions and see things differently. We hope these experiences stay with students for the rest of their lives." Making an estate gift was attractive to the Calers because it allowed them to provide for their family members and Elon in the future without parting with significant resources now. "Your gifts can make a bigger impact at Elon than they can at a lot of other schools," Pat said. "We see what our money does at Elon, and we're impressed." For more information on estate and other planned gifts at Elon, please contact Carolyn DeFrancesco at 336-278-7454 or cdefrancesco@elon.edu You may also visit Elon's planned giving website.